By the 1960’s, it seemed like the centuries old problem of accurate weather forecasting was finally about to be solved. Scientists had long assumed that the math behind weather forecasting was relatively straight forward. Like a river, the atmosphere is a fluid in constant motion. Once you chart this flow, you should be able to determine how temperature, humidity and all other properties of the atmosphere change over time. What was lacking up until the 1960s, scientists assumed, was enough data and enough computing power to chart the atmosphere’s complex, three-dimensional flow. Seemingly overnight, new computer technologies and funding for science research changed everything. For the first time, real-time weather station data was being collected from all corners of the planet. This information was being beamed to weather forecasting centres, where computers collated the data into powerful new weather models. But these new computerized-forecasts were disappointing. At times they seemed just as prone to errors as ever before. The promise of accurate, long-term forecasting was, once again, maddeningly just out of reach. It was during this era when Edward Lorenz, a meteorologist and researcher at MIT, was experimenting with simple weather models. Lorenz had a guess that perhaps the reason why weather models of the day returned such poor forecasts was because the atmosphere did not behave in a straight-forward manner. Lorenz built a very simple weather model using so-called ‘nonlinear systems of equations’. These are math formulas that interact with each other to produce unpredictable results. The computer Lorenz used was instructed to model how a piece of air in a closed container being heated from below would move over time. Following the rules of physics, the heated air at first rises and then cools as it travels away from the heat source, transferring its heat to neighbouring pieces of colder air. 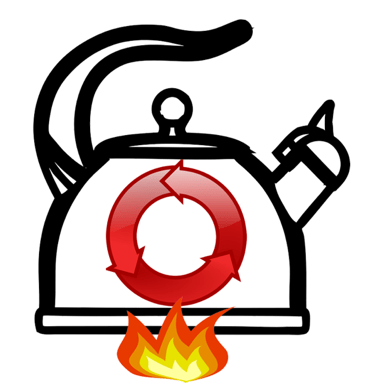 At a certain point, the air and begins to fall back toward the heat source. Simply put: Lorenz had built a simple convection model, illustrated below. Lorenz would let his model run for hours, allowing the computer to spit out months of simulated ‘weather’. As the story goes, one day Lorenz wanted to re-run part of his model, but not starting from the very beginning. From his print-outs, he copied down mid-experiment numbers from a previous run of the model, and used these as the initial conditions. In essence, he was trying to save himself some time by jumping into the model mid-way. Since it would take a few hours to compute, Lorenz went to grab a coffee. Nobody could have known that an entire new field of mathematics, and a completely different understanding of atmospheric physics, was about to be discovered by accident. When Lorenz returned, he was dismayed to see that the model hadn’t repeated itself: after just a few days of simulated weather, the numbers his computer printed out were completely out of phase with the initial simulation he was trying to repeat. This was very strange: up until now, every single time Lorenz ran his model with the same set of initial values, it would produce the exact same forecast. When he typed in these new numbers the model started to behave like it had a mind of its own. Naturally, Lorenz assumed something was wrong with his computer. But, after a careful look through the computer code, he spotted the issue: he had rounded off the values he typed into the computer to three decimal places of accuracy, whereas the computer originally used six decimal places. Lorenz assumed, as did everyone at that time, that the extremely tiny differences between the rounded-off and original values would have almost no noticeable effect. Instead, they multiplied many times over, generating an enormous impact. This result had shockingly deep consequences for Lorenz and everyone else working on the problem of long-term weather forecasting. The smallest deviations in initial values in the model changed the result of the entire forecast. Ultimately, Lorenz surmised, this means that even if you had a weather station at every point on the Earth’s surface, recording data every second, very small inaccuracies in any one of these millions of measurements could throw the entire weather model out, generating a completely different forecast after just a few days. In short: Lorenz discovered that long-term weather forecasting is probably impossible. From this, it is easy see why some people are skeptical about long-range climate modelling. Climate, after all, is just a word describing the behaviour or pattern of weather over a period of time. But, thankfully, the story doesn’t end here. At first, the information Lorenz’s computer spat out looked like random noise. But after the model was left to run long enough, a beautiful butterfly pattern emerged from the chaos. ‘Lorenz’s Butterfly’, as this pattern is sometimes called, traces the path that the little piece of air in the simulated convection model took over time. Its temperature, speed and roll (clockwise or counter-clockwise) are the values being graphed over time. Like how a planet is attracted to the sun by gravity, the image is reminiscent of the path an object might take if it were bound by two ‘attractors,’ or regions on the graph that seem to prevent the piece of air from flying off into space. You can run the Lorenz weather model forever: each time you do it will fill in the butterfly a little more until it just looks like a solid mass; but never will the piece of air repeat a previous path, and never will it zip away from the two attractors. So while you can never know for certain what the precise temperature, speed and roll of the air will be at some point in the future, you can know for certain that it will be somewhere inside the butterfly, bound by the attractors. 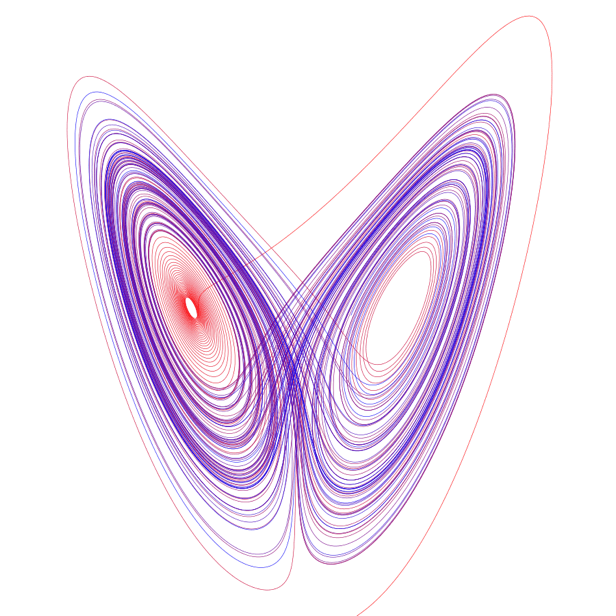 Eventually, an entire new system of mathematics called Chaos Theory was laid out by Lorenz and others to help deal with systems like the Lorenz Butterfly. Chaos Theory tells us that there are deep patterns embedded inside some nonlinear systems. Today, we say that weather is chaotic, not random. Its state is incredibly sensitive to initial conditions. Just as Lorenz left out the tiniest bit of information when he inserted rounded-off values into his model, one cannot rule out that the flapping of a butterfly’s wings over some part of the world can, given enough time, set into motion the conditions necessary to produce a hurricane over the tropics. Equally important, however, is that over long periods of time, a pattern does emerge from the chaos. This pattern is predictable, meaning we can describe and we can model it. In the atmosphere, we call this pattern climate. Climate modelling works because weather is chaotic, not random. At their core, climate models are the same as weather models. By running many climate models over and over, a pattern in the noise emerges. This pattern tells us what kind of weather a location should expect over a period of many years. Today, climate models are used to understand past climate changes and to warn us of the dangers of continued human-caused climate change. These models answer “what if” questions about the atmosphere, like “what caused the last ice age?” and “what will happen in fifty years if greenhouse gas concentrations continue to increase at their current pace?” The proven ability of climate models to describe Earth’s past and present climates gives us confidence that they can accurately predict the planet’s future climate, too. Lorenz’s system of nonlinear equations opened up an entirely new system of mathematics, and turned the world of long-term weather forecasting upside-down. But it also demonstrated that effective long-term climate modelling is possible. Literally. Scientists assumed the bulk of equations driving atmospheric systems were so-called ‘linear systems of equations,’ which are predictable and retraceable. These contrast with ‘nonlinear’ equations, whose behaviour is far less predictable. Previous: Previous post: Can electric vehicles solve the climate crisis? Next: Next post: Where Do Canada’s Greenhouse Gas Emissions Come From?